Partial remains of some victims of the 11 September attacks ended up in landfill, a Pentagon report has found. Some small portions of unidentifiable remains from the Pentagon, and from the Pennsylvania field where a hijacked plane crashed in 2001, were given to a private contractor for disposal. The fragments "could not be tested or identified,"the review said. The disposal came to light as the US defence department probed practices at the military's Dover Port mortuary. The air base at Dover, in the state of Delaware, is the main point of entry to the US for the bodies of troops killed while serving overseas. However, an investigation by the Washington Post newspaper uncovered evidence that unidentified body parts were being cremated and disposed of in a landfill. The practice of putting partial unidentified remains in landfill was stopped in 2008. President Barack Obama was briefed on the probe and supports plans to ensure "these types of incidents never happen again," the White House said. The official report into the Dover mortuary found that this practice began shortly after the September 11 attacks, when "several portions of remains from the Pentagon attack and the Shanksville, Pennsylvania, crash site could not be tested or identified". It confirmed that the base's mortuary cremated unidentified fragments, then gave them to a biomedical waste disposal contractor. This contractor incinerated the remains and then put any material left over in a landfill site. Officials at the Dover mortuary assumed that "after final incineration nothing remained", the report says. There is no suggestion that remains of victims who died in New York were handled in this way. Speaking at a news conference at the Pentagon, retired General John Abizaid said: "We don't think it should have happened." 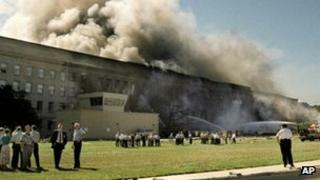 A total of 184 people died when a hijacked plane crashed into the Pentagon on 11 September 2001. Forty people were killed when another plane crashed in a field in Pennsylvania, after passengers overpowered the hijackers. The Pentagon review of the Dover practices, chaired by retired US Army General John Abizaid, was hailed by US Defence Secretary Leon Panetta. It "highlights weaknesses in the overall command and oversight structure at the Dover Port Mortuary", Mr Panetta conceded. In a statement, he promised "the families of our fallen heroes... that every step will be taken to protect the honour and respect that their loved ones richly deserve".